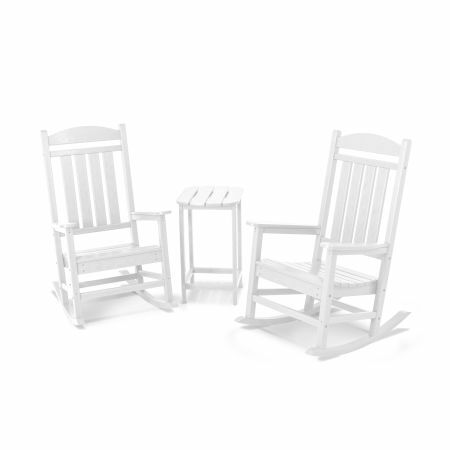 POLYWOOD® White Resin Rocking Chairs are a timeless addition to any home. Their simple elegance complements any style of home, porch, patio or backyard. An outdoor rocking chair provides a much-needed break from the rush and stress of everyday life -- and that kind of comfort never goes out of style! Perfect for quietly listening to the sounds of nature while enjoying a refreshing drink or kicking back with a good novel, an outdoor rocking chair will surely remind you of the simple pleasures in life. 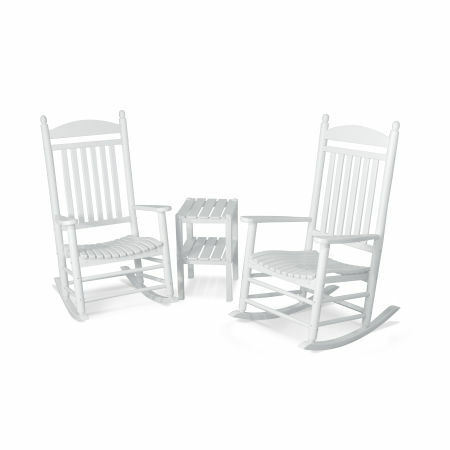 POLYWOOD® White Resin Outdoor Rocking Chairs have been specifically designed for comfort, class, and durability. 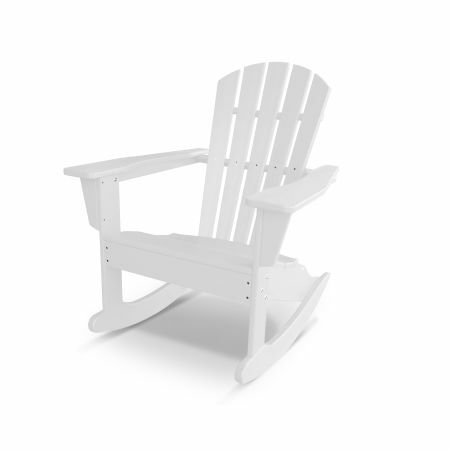 Our eco-friendly rocking chairs are made from a type of resin called high-density polyethylene that is derived from post-consumer plastic bottles, such as milk jugs, that has been decontaminated and purified. Resin is an ideal material for all-weather furniture like our outdoor rocking chairs because it is both durable and weather resistant. 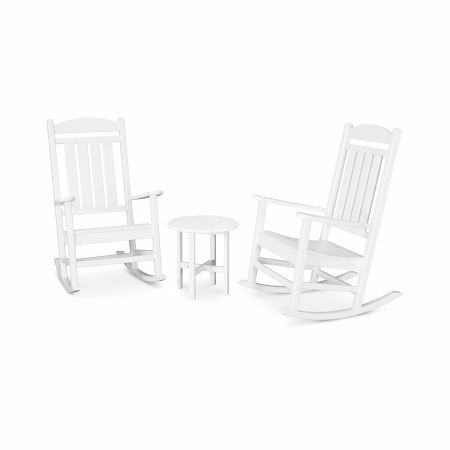 Our white resin rocking chairs are made from lumber that will not rot, peel, crack, fade, or splinter even under extreme weather conditions like excess heat and rain, year after year. In fact, we offer a 20-year warranty on our furniture. Low maintenance means more time spent relaxing in your rocking chairs outside. With just a simple wash with soap and water every now and again they’ll look as good as they did the day you bought them. 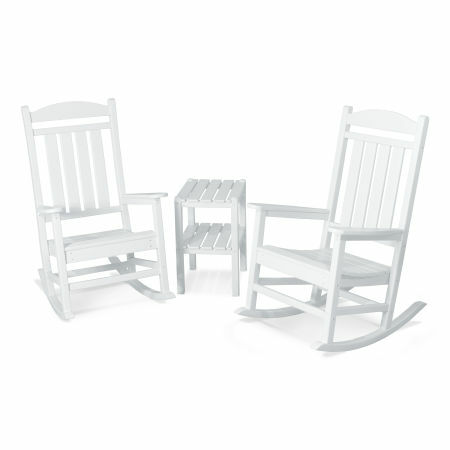 If you love the look of a classic white resin outdoor rocking chair, there are endless options of styes to choose from. 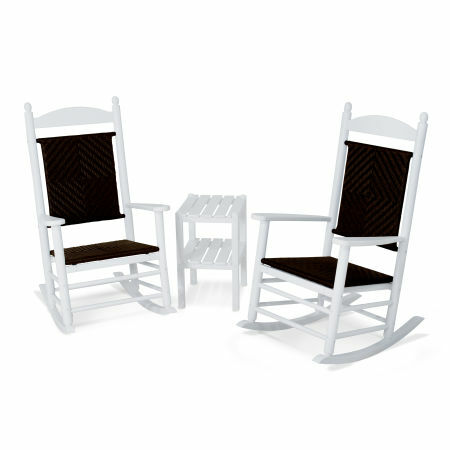 Opt for the traditional Presidential, the woven-back Jefferson, arched Adirondack, or one of our other beautiful styles sure to speak to your outdoor aesthetic. 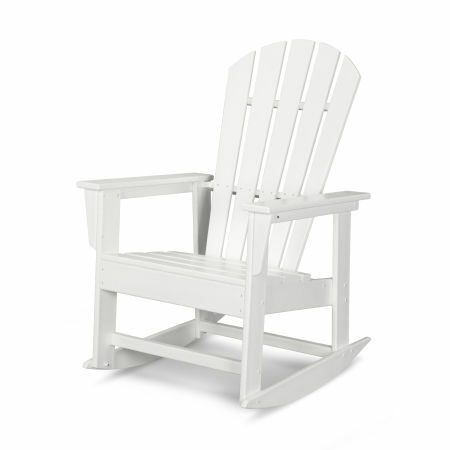 While white rocking chairs blend seamlessly with any outdoor palette, if you’d like to add a pop of color, try our Sunbrella® upholstered rocking chair cushions and pillows. Crafted with the same dedication to durability as our furniture yet delightfully plush, our seat cushions will make sitting on your rocking chair a luxurious treat. In the event you decide on a shade other than white, we also offer a vast selection of bright, medium, and natural hues. Can’t decide on a color? Contact our Customer Experience Team for free color samples.